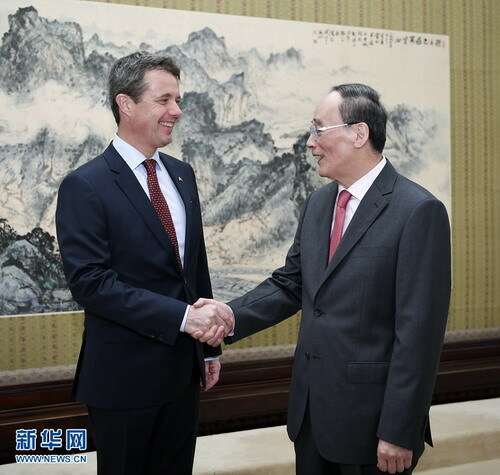 On September 27, 2018, Vice President Wang Qishan met with Crown Prince Frederik of Denmark at Zhongnanhai. Wang Qishan said that China and Denmark enjoy long-term friendship with frequent cooperation and exchanges at all levels and in various fields. The successful meeting between the two heads of state in 2014 injected new impetus into China-Denmark comprehensive strategic partnership. China's choice of development path and the great changes since the founding of the People's Republic of China were deeply steeped in history and culture, and strengthening cultural self-confidence and achieving cultural renaissance were important components of the great rejuvenation of the Chinese nation. Cultural diversity is the essential feature of a diversified world. Only by learning about the historical and cultural origins of different countries, can we understand the different paths and systems chosen by various countries and the theoretical support they followed. The Chinese side is willing to, together with the Danish side, further enhance non-governmental contacts and cultural exchanges, and consolidate the foundation of mutually beneficial cooperation and the friendship between the two peoples. Frederik expressed that China enjoys rapid and new development with glorious achievements. The Danish side stands ready to take the 10th anniversary of the establishment of Denmark-China comprehensive strategic partnership as an opportunity to strengthen bilateral cooperation and exchanges in various fields.